WASHINGTON — President-elect Donald Trump, in a combative and volatile press conference that showed little concern for Oval Office norms, on Wednesday repudiated leaks of unconfirmed claims that Russian spies may have information on him so salacious it could expose him to blackmail or foreign coercion. Trump ignored questions about a separate allegation in the leaks — declining to say whether anyone from his campaign had contact with Russia’s leadership in what may have been an attempt to undermine rival Hillary Clinton. And he leveled a harsh charge against American intelligence services for includingthe two-page summary of potentially compromising information in a confidential report, escalating his feud with the agencies just 10 days before his inauguration. For the first time since July, the president-elect held a press conference — nine days before he is set to be sworn into office. His comments came amid calls in Congress for further investigation into Russian hacking and efforts to influence last year’s presidential contest. But Trump also used his press conference to praise Russian President Vladimir Putin. During the hourlong press conference held in front of a backdrop of American flags inside Trump Tower, the president-elect also sought to reduce conflicts of interest related to his sprawling business empire. His staff piled a stack of paperwork on a table next to Trump in which he signed over control — but not ownership — of the Trump Organization to his two oldest sons. Even then, he noted with satisfaction that as president he was immune from conflict of interest provisions that apply to other federal officials, including his Cabinet nominees. He said that over the weekend he turned down a $2 billion deal in Dubai. Trump said that he would soon deal with health care, begin building a wall along the southern border, and within two weeks of his inauguration announce a Supreme Court nominee. He also announced he was asking David J. Shulkin, a current undersecretary at the Department of Veterans Affairs, to stay on and lead the agency. He said he interviewed “at least 100 people” for the job, among them former senator Scott Brown. Trump — who built a campaign on conspiracy theories, questions over President Obama’s birth certificate, and “people are saying” accusations — is now himself bearing the brunt of similar charges yet to be confirmed or discredited. “As far as hacking, I think it was Russia,” he said. “But I think we also get hacked by other countries, by other people.” He blamed the Democratic National Committee for not doing more to protect its information and said that he warned the Republican National Committee during the campaign to protect itself. He did not dispute an assessment in which intelligence officials concluded that Putin preferred Trump over Clinton. “If Putin likes Donald Trump, guess what folks: That is called an asset, not a liability,” he said. 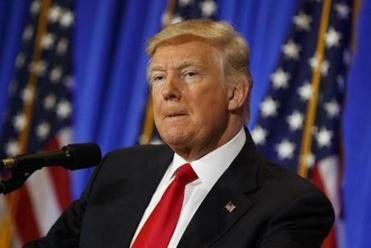 Trump continued to refuse to release his tax returns, saying that no one cared but the news media and asserting that he was unable to release the results because they are still under audit. As Republicans in Congress grapple with the thorny problem of how to repeal the national health care law without creating a huge political backlash, Trump said his administration would produce a specific plan soon. It will be unveiled shortly after his secretary of Health and Human Services nominee, Representative Tom Price, is confirmed, he said. “It’ll be repeal and replace,’’ he said. “It will be, essentially, simultaneously. It will be various segments, you understand, but will most likely be on the same day or the same week. But probably the same day, could be the same hour. “You’re gonna be very proud of what we put forth having to do with health care,” he boasted. Trump also said he would continue with plans to build a wall along the US border with Mexico. But he conceded it could initially be built using federal tax dollars. “Mexico, through some form . . . will reimburse us,” Trump said. “That will happen. Whether it’s a tax or whether it’s a payment. The press conference was also a preview of the potentially antagonistic relationship the incoming administration may have with the press corps. The event began with Sean Spicer, who will be White House press secretary, meting out a tongue-lashing to the hundreds of reporters in attendance. Trump and his top officials conflated CNN’s first report that Trump was briefed on the potentially compromising Russian intelligence, with BuzzFeed’s highly controversial decision — condemned by other media outlets — to publish all of the actual documents about the intelligence, which contained numerous inflammatory and unconfirmed statements by unidentified sources. During the press conference, CNN’s senior White House correspondent, Jim Acosta, attempted to ask Trump a question. Acosta reported afterward that Spicer told him if he tried to interject like that again, he would be kicked out of future press conferences.